Conventional wisdom holds that election activity begins after Labor Day. But by Labor Day, a majority of voters will already have made up their minds about the charter amendments, ballot measures and other “down ballot” issues lacking the high profile of a mayor’s election or a contested sheriff’s race. The true San Francisco campaign – one that sets the table for what follows – will all be completed in August. That’s because by the third week of August, all the important decisions about the Voter Handbook will be complete. With a significant percentage of voters casting early or absentee ballots, the Voter Handbook is the most important campaign material they will have. If activists, partisans and community members hope to bring their neighbors to share their preferences, here is the CitiReport Guide and Calendar. Elections have been won (and lost) based on how the Ballot Simplification Committee describes what the measure will do. The committee has an open process, accepts testimony at its meetings, and votes in public on the wording that will appear in the Voter Handbook. The begin meeting in less than ten days – on August 1. They have two weeks to complete their work, by August 15. The City Controller provides an estimate of the impact on the measure on city costs. The Controller can determine there is no cost, there is a potential for reduced costs, and there could be increased costs. This year the Controller’s estimate will be critical for the dual pension reform measures by Public Defender Jeff Adachi and Mayor Ed Lee and the Board of Supervisors. Many voters look no further than the Controller’s estimate of costs. Partisans and community members can advance their arguments on the cost to the Controller, but the decision process is behind closed door. While the process is underway for Ballot descriptions and costs, the Elections Department will determine in what order measures will appear on the ballot. Charter amendments and bond measures are first, and then come the proposed ordinances and policy statements. The deadline for assigning a ballot number is August 8. That matters because some voters never get to the last on the list, so appearing at the head of the list likely will generate more votes. From noon until noon during this ten day period, the public can comment on the Ballot Simplification Committee’s digest of ballot measures, the Controller’s analysis of cost impact, and any questions that have been posed by the City Attorney regarding these measures. At this point, it’s unclear whether City Attorney Dennis Herrera, who also is a candidate for mayor, will recuse his office and turn this responsibility to an office outside San Francisco. Public Defender Jeff Adachi already raised questions about whether Herrera has a conflict of interest, noting that Herrera has publicly endorsed the participated in the discussions for the mayor’s competing measure. Regardless, this is the ten-day period for the community and interested parties to critique, complain and cajole officials for further revisions. Official arguments for and against measures are due just three days after the Controller and Ballot simplification committee have completed their work. August 18, a Thursday, is the deadline for official arguments. The Controller’s numbers and ballot language is due on Monday, August 15, which leaves just the Tuesday, August 16 Board meeting to decide on the official arguments (although as a tradition, City Hall is allowed to hold back on one measure until later in the process). Paid arguments are due the following Monday, August 22. These are from political clubs, partisans, campaign committees, the Democratic Central Committee – any group or individual who wants voters to know what they think is at stake. It’s not difficult to see from this calendar that early August is when most political clubs will have to vote on endorsements, in order to have a paid ballot argument. They will also have to get out their checkbooks, because a paid ballot argument costs $200 plus $2 for each word. That cost can be defrayed to some extent by gathering signatures in lieu of payment, at 50 cents for each signature. Paid signature gatherers are permitted. Voters can get an idea of just how deep the pockets are for some campaigns by glancing at the bottom of the paid arguments to see who paid. Typically well-funded campaigns will round up citizens and groups they believe are influential with voters and pay for them to place a paid argument in the handbook – and often writing their opinion for them as well. In past elections, candidates also had an asterisk with their name in the Voter Handbook indicating they accepted the voter-approved spending limits and public financing. This time, however, no such notification will appear. The city’s Ethics Commission decided it was too much trouble to provide this information to the Election’s Department in a timely manner, and won approval to strike the requirement. San Francisco operates on a permanent election cycle, so those who miss the August timetable for November’s election will have a chance to aim their sights on the November 2012 election at the same time. The newly minted Redistricting Task Force is expected to hold its first meeting in August, and faces an April 2012 deadline to decide on the new lines for district elections. That’s when incumbents and candidates will learn exactly which voters will decide their fates. First to feel the impact will be Eric Mar (District 1), David Chiu (District 3), and David Campos (District 9). 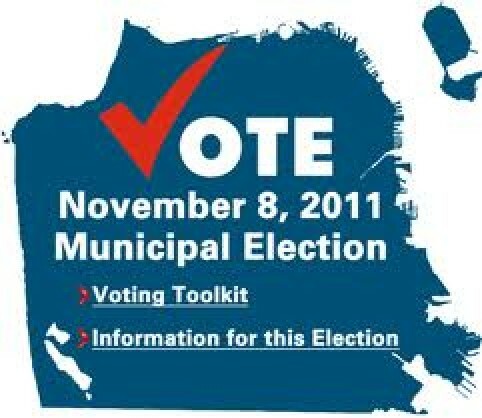 Districts 5 (Mirkarimi) and District 7 (Elsbernd) will be open seats. Meanwhile, the state redistricting task force has made its initial decision that State Senator Leland Yee’s district will end in 2012, allowing State Senator Mark Leno until 2014 before facing voters again. Next post: City Scofflaws: Book’em, Dano!